Ever took a digital photo with flaws but do not know how to correct them? Tired of having photos that are too dark? Feel frustrated when you have ideas for designing posters but simply do not know how to express them? Then our Photoshop Course 2009 is an event you should look forward to! We provide tips and tricks of editing digital photos to correct common digital flaws and make them decent enough to display them proudly in Facebook. Tips such as removing acnes, touching up backgrounds, creating photo frames and other practical tips are presented in the Photo Editing Course. Whereas for the Poster Designing course, we will be sharing techniques on how to create an interesting and attractive poster. 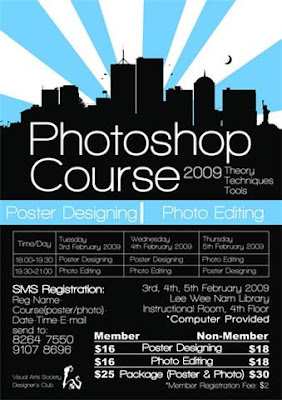 The Photoshop Course will be held on the 3rd, 4th and 5th of February 2009. Further details are stated in the poster attached. It is very useful to have such course. Thank you for sharing this. Photoshop is kind of software needed almost everywhere. You can also try to use such plugin as this https://aurorahdr.com/create-hdr-with-photoshop-elements11 to make awesome HDR images.